This is the story of the 2011 Topps Update Mike Trout Rookie Card, a trading card that isn’t yet eight-years old, but is rising in price and stature right before our very eyes. This is the story of a trading card with no ink autograph, no memorabilia swatch and no serial numbering. It’s not shiny and not made of chrome-like product. Yet this fairly new card featuring the game’s brightest young star is selling for anywhere between $300-$600 in high-grade form. It wasn’t seeded in packs at 1:1,000,000 odds. It’s not shiny, reflective, nor made from some special chromium material dug from near the earth’s core. It’s made of paper. So what is happening with this card? Sales. Lots of sales. Consistent sales, both in graded form and raw. The card has been a staple of the Beckett Baseball Hot List for more than two consecutive years, three times holding down the No. 1 spot in 2017 and five times at No. 2 last year alone. “Considering what it is –- no autograph or serial numbering – it’s really, really strong,” says Beckett Senior Price Guide Analyst Brian Fleischer. “We have so many sales in the low $130’s to low- to mid-$200’s for raw copies. The volume of completed sales is big. Sales have been strong throughout the winter, perhaps in anticipation of an injury-free MVP season from the Angels’ star in 2018. An MVP campaign certainly isn’t out of the realm of possibility with Trout. He’s already won two American League MVP awards and runner-up for the award three times. And he doesn’t turn 27 until next August. With success like that, no wonder his key cards are among the most popular in the industry right now. Part of the attraction of the Topps Update is the picture itself -– baseball action, vibrant color with a RC logo that pops off the card. Extra Edition (#’d/495) each feature an autograph – but they were released two years before his big-league debut, and although very collectible in their own right, they are considered pre-Rookie Cards in the eyes of the industry. 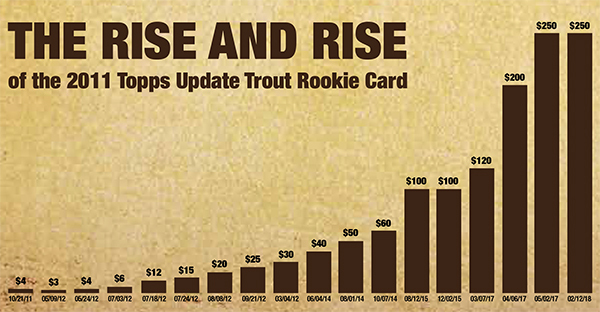 The rise of the Topps Update Mike Trout Rookies also has exposed many of us to be less-than-stellar talent scouts. How many of us sold the card upon its release, thinking there was no way this kid was going to live up to the early hype? After all, Mike Trout wasn’t MIKE TROUT in the Fall of 2011. In a 2015 message board conversation about the Trout card, nearly three years ago, one collector was lamenting even then of having parted with his Trout card in trade. The card saw a steady climb in value from the Fall of 2012 to Fall of 2014, then it took off. Not surprisingly, it was in 2014 that Trout won the first of his American League MVP awards, leading the majors in runs (115) and the AL in RBI (111). Less than a year later, the Trout card reached $100 in value while the player himself was pushing for a second-straight MVP. He ultimately finished second to Toronto’s Josh Donaldson in the 2015 MVP voting, despite slugging 41 HR, and leading the league in SLG % (.590) and OPS (.991). Trout’s second MVP in 2016 helped push the card to $200 and then $250 where it is today. But can it go any higher? Or is this the best we can expect for a non-autographed, non-serial numbered Rookie Card? 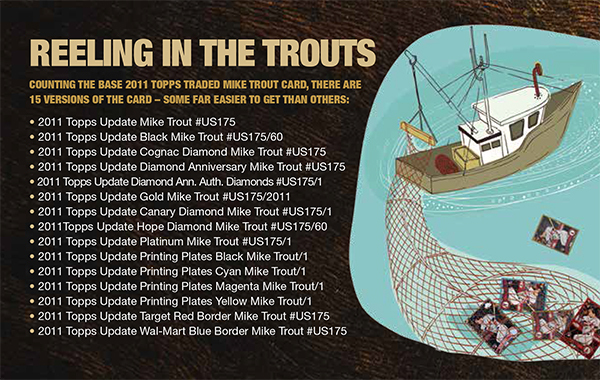 One of the things that helps the 2011 Topps Update Mike Trout is the image. It’s vibrant. It’s colorful and it looks great in one of the mainstream grading slabs. Don’t take that point lightly. Who knows where this card will be in ten years –- it all depends on what the player has done on the field. But if Trout continues laying out a Hall of Fame career, more and more of these RCs will be graded to avoid the usual fakes and unauthorized reprints that seem to filter their way onto the market. This doesn’t include the Topps-produced reprints the company has included in a few sets, because those are obvious reprints where the company added serial numbering to the front and/or changed the back in some way. Those are obvious reprints. More importantly, they’re reprints from the copyright holder. Already some reprints -– some of them identified as reprints in the auction header -– are being bought and sold on eBay. But from what we’ve seen, they don’t include the word “reprint” anywhere on the card, which, of course, can create huge problems should the card find its way back into the secondary market. Some collectors who have purchased the advertised reprints haven’t been bowled over by the quality, citing a lesser-quality image on the card front from the original and either partial foil or no foil on the card. 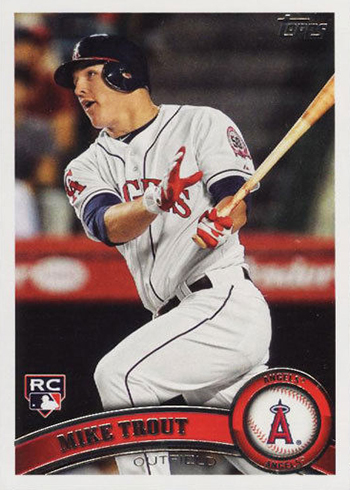 This may sound like one of those Captain Obvious commercials, but if you are considering buying a 2011 Topps Update Mike Trout Rookie Card do your homework. • If you are buying a raw card online, check feedback. Are there any questions about authenticity from past sales? • Check and see if the word “reprint” or even “rp” is in the seller’s header. If so, you are buying a reprint. Know what you are buying. • If the card is $5.95 with free shipping…well, you get the point. • There are lots of real ungraded 2011 Topps Update Trout cards for sale. Just know who you are buying from, and understand the rules of returns. Yes, there are those looking to make a quick buck –- however small that may be –- but there are others who commit to doing things right. • Finally, again, if you are not sure buy a graded card from a reputable and recognized grading company. The great thing about this Trout card is that few are priced out of owning an authentic copy. That’s great news for those wanting an iconic card of one of the game’s great players at an affordable price. We don’t know Trout’s future more than anyone reading this, but we do know stats and how his career is shaping up. And we do know talent when we see it. Where will this card be in five years? Ten years? Maybe it will be inside a box somewhere, with the buyer cursing paying the $250 it cost. Or maybe the buyer will be happy that he or she got the card for “only” $300 –- dirt cheap -– and patting themselves on the back for such a shrewd buy. In this world of autographed RCs, shiny cards with serial numbering and super-duper chromium card stock, this piece of paper is quite intriguing. Your Turn (Beckett Baseball No. 77): Who’s your hobby Rookie of the Year? I pulled this Trout RC card from a pack in 2011 and packed it away as a common prospect with no recognition of what I had. I didn’t even know I had it when I began to wonder if I might. Then when it started heating up a couple/few years ago I went looking for it hoping I had a copy. Found it in my piles of unsorted cards and immediately put it in a penny sleeve. I’ve watched the value climb since and I’m happy to own a copy of a card that’s so valuable and volatile. This makes me happy to see a regular card have value. I’m one of the thousands of collectors from the 80s and early 90s who left the baseball card industry in the mid-90s because of the rampant limited edition cards. Collecting cards no longer became fun, because they became unaffordable. This Trout card at $250 is also unbelievably unaffordable. But you know what? It came from a regular pack in regular quantities. Topps didn’t artificially make this card elusive. Hooray for the regular card becoming popular. This is a great thing for the card industry. I would like to see much less of the serialized, autographed, swatched cards. Will that happen? Most likely not. Topps and other card manufacturers have brought the genie out of the bottle. The desirability of these limited cards is too great. Topps is happy to print pure gold on their presses for the masses who drool over them. However, there are thousands of people who don’t drool over limited edition cards. In fact, they turn their backs entirely on the industry because of these manipulative cards. It’s my sincere desire that others in the industry turn their backs on manipulative cards, and instead, turn towards the regular cards in regular packs. Please define what you consider to be “high-grade” form? BGS 9-9.5? Because I see Pristine BGS 10 selling for $900 and up. So that’s a high grade as well but obviously a whole separate level. The lesson here is, you can still make a valuable card without having to insult “consumers” intelligence with gimmicks. You do not need 73 different levels of parallels in every product. You do not need to force collectors to have to read a code on the back of the card in order to figure out what the card is. “Added Value” does not necessarily add value. Design, structure, and product integrity still matter. The 2011TU Trout single-handedly refutes all the post-Shorin era product development trends. Those working in Hobby product development might want to take note. Was lucky enough to grab a few off of E-bay for about $7.00 apiece before his career really took off. I suggest also grabbing the Altuve out of this set as that card is starting to take off. As a budget collector I usually stick to the base Topps set or Topps Chrome at most. I have the Trout rookie card plus the emerald card and gold card out from one hobby box. Plus the DiMaggio emerald card. I need to get them graded. Are there any in Texas I can personally take them to? @Richard — If you’re in the Dallas-area, you can drop them off at the Beckett Grading offices. Great read. I have 3 of these, all pulled from packs. 2 base graded BGS 9.5 and a Cognac graded BGS 9. I remember selling a raw one to my local hobby shop owner for $15 cash when it booked for $25. Worst hobby decision I ever made. Glad I still have some though. Can you find this card in a factory sealed set? @Chris – It was not in a factory set.